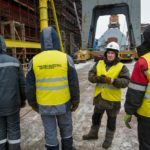 On the eve of Victory Day the group of companies Spetstyazhavtotrans successfully completed the most important stage in the construction of the nuclear icebreaker “Siberia” on the Vasilievsky Island – the lifting and erection of electric propulsion motors. 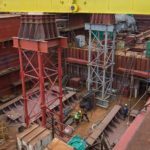 On May 5, the last aft electric motor was installed on the ship. 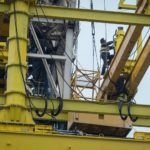 “Installation of electric motor is a very important and complex technological stage,” says the project manager Sergei Chernogubovsky. 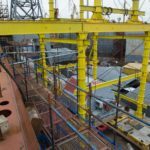 – In fact, this is one of the three main stages of the construction of an icebreaker, which determines the further course of work. The next significant events will be the installation of a reactor and the loading of a steam-turbine unit. 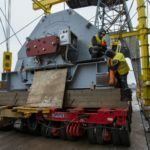 The third aft propulsion electric motor was removed from the barge with the help of a floating crane, then it was transported through the territory of the Baltic plant to the place of installation works. Further, their role was played by spinning jacks and a lateral displacement system. 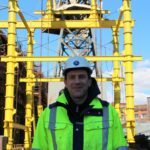 “The work was carried out with the help of a new Russian technology – a portal of a modular type,” says Vadim Orlov, director of projects for transportation and installation of the equipment of SC “Spetsstyazhavtotrans”. – Unlike cranes, the portal is more stable, capable of withstanding a large wind load due to the design feature. All this allows for an uninterrupted upswing, which is extremely important under the weather conditions in St. Petersburg. Total lifting capacity of the portal is 500 tons. It is compact, all the elements are dimensional, the assembly and preparation for operation take two weeks. 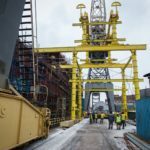 Initially, for the construction of the icebreaker, it was proposed to use traditional cranes with a carrying capacity of 500 tons, but the cumbersome crane structure has dimensions that are inadmissible for the center of St. Petersburg and can’t undergo architectural supervision. 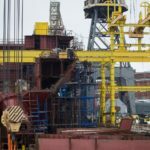 Engineers of GC “Spetstyazhtrans” offered the shipbuilders the idea of alternative installation, which havs a much smaller size, does not require a large area of accommodation, has another important advantage in the construction of the ship. The matter is that the icebreaker is assembled by sections. 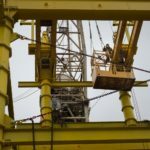 The rigging system “Spetstyazhavtotrans” is unique in that it does not interfere with the assembly process and can be mounted on the basis of the current readiness of the vessel at any stage. 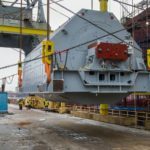 In this way, five elements with a weight of 310 tons were mounted on “Siberia”: two tanks of metal protection and three propulsion electric motors. The rigging portal was designed and manufactured by the specialists of SC “Spetstyazhavtotrans” jointly with the Department of Lifting and Transport Systems of the MSTU named after. Bauman. 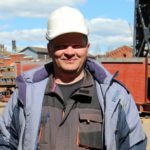 The head of the department is the chairman of the board of SC “Spetstyazhavtotrans”, candidate of technical sciences Sergey Tropin. 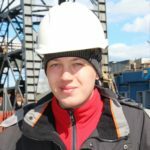 The works of lifting and mounting heavy equipment of the icebreaker “Siberia” were supervised by the young engineer of the SC “Spetstyazhavantans” Pavel Gorokhov, who is graduate and post-graduate student of the Bauman Moscow State Technical University.